Crispy caterpillars, fried crickets and butter tossed larvae. Doesn’t that sound appetizing? Okay, so maybe something more ‘common’? 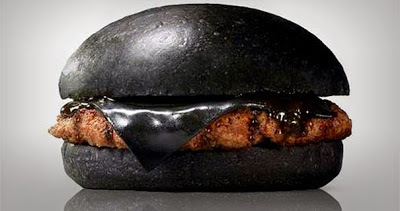 What about a black hamburger, made with black buns and black cheese? The impression people get from their food, influences how people select their food, and how much they eat. Palatability, how pleasant you rate your food, is determined by the hedonic evaluation of sensory properties like taste, smell, texture, temperature, visual appearance and sound (Sorensen et al., 2003). And of course, the role of appearance in food choice should not be under-estimated as the ‘first taste’ is almost always with the eyes. Visual cues will often affect the willingness to eat a certain food (Imram, 1999). The appearance of a food is built up out of different dimensions such as color, opacity, visual structure and visual texture. Of all these effects, the effect of color is the strongest according to most studies (e.g. Maga, 1974; DuBose et al., 1980). The black burger shown in the image above is one of two types of black burgers, which are called the ‘Kuro Diamond’ and ‘Kuro Pearl’ burgers and are for sale in Japan. They owe their striking appearances to the use of black buns and cheese, which have been colored black with bamboo charcoal, and black garlic sauce, which has been colored with squid ink. Although research has been investigating whether or not food coloring influences taste and flavor for a long time, results remain very ambiguous to this day. Visual cues may modify a food’s flavor, but usually it is thought that food color is not essential to assess taste (i.e. you can taste without seeing the food as for example blind taste tests)(Spence et al, 2010). However, in general it is believed that color may influence the perception of sweetness, and thus influence palatability (Spence et al., 2010), as well as that it gives us an indication whether or not our food is still consumable (e.g. strawberries that have started to rot and thus have gone almost black are likely to be inedible). This is in line with the arguments of Maga (1974) who argued that the redness of fruits, and the intensity of that red is an indication of its ripeness and sweetness. Many fruits go through a transition of color from green/yellow to red shades when ripening. Earlier exposure in life to this natural change in color and resulting taste change correlation (the correlation redness level and the sweet taste of fruit) may explain why for example a brighter red color should have such a profound effect on perception of taste: we expect fruits that are more red to be sweeter (Maga, 1974; Spence et al., 2010). This may also explain why a color like black would result in a decrease in palatability of the food, as this may be a natural indicator of ‘overripe’ foods, or ‘foods gone bad’. It thus seems very likely that when we observe a certain food, that its color, together with other contextual cues like the temperature of the food and the texture of the food will cause us to have certain expectations towards the flavor, consistency and overall palatability of the food (Spence et al., 2010).However, it is very important to note that many different expectations towards the taste of the food will arise in different people. These interpersonal differences depend on the background of the individual, their prior experience, but also their age and culture (see Spence et al., 2010). A good example of this is that the above mentioned food colorants, squid ink and bamboo charcoal, are common food additives in Japan, whereas they are very uncommon in Europe. Prior experience with certain foods, background and culture may also be a very important factor influencing people’s willingness to eat certain foods. One example of this is people’s willingness to eat insects. Eating insects, also called entomophagy, is not common in Europe, but very common in other cultures in e.g. Africa and Asia (DeFoliart, 1992). However, it is also gaining popularity here in Europe. Hundreds of different insect species have been known to function as human food. Some of the more important groups include grasshoppers, caterpillars, beetle grubs, termites, bees, wasps and ant brood (larvae and pupae) as well as winged ants, cicadas, and a variety of aquatic insects (DeFoliart, 1992). Typically, insects are not used as ‘emergency food’ in order to fight starvation, but are part of the everyday diet and are used all throughout the year or when seasonally available. Insects are actually really healthy: they are very high in crude protein, have a wide variety of fat (and energy) content depending on the species, whereas the cholesterol levels in insects vary from non-existent to approximately the levels found in other animals. Furthermore they are also known to be a rich source in magnesium, iron, copper, zinc, thiamin (vitamin B1) and riboflavin (B2) as well as chitin, which is a source of fiber (DeFoliart, 1992). The downside of entomophagy is that some insects secrete toxins, toxic metabolites or have toxic chemicals from foodplants build up in their bodies. However, it seems that those insects that are purposely harvested for human consumption do not pose any significant health problems (DeFoliart, 1992), especially when considering the long history of entomophagy. Entomophagy is also very beneficial in the realm of pest management (e.g. eating grasshoppers will help lower their count and could thus aid in pest control)(DeFoliart, 1992). Additionally, if entomophagy becomes more common this could benefit our environment, as the emission of ammonia and greenhouse gases are much lower for insects than for livestock. Nevertheless, the cultural background here in Europe makes it likely that eating insects does not seem very appetizing to the ‘regular European’. Especially appearance-wise, their texture may look weird and, as explained previously, visual contextual cues can influence how palatable we find our food. However, clearly entomophagy has many benefits and it may be well worth a try, who knows, it may taste very good, even though the color or texture may be different from what we are used to. So, now you know that ‘strange’ foods are not all that bad; and that how we regard the food is likely to influence their actual taste and that eating things like bugs may even be good for our environment, would you be willing to give crispy caterpillar a shot, or is trying that black burger as far as you are willing to go? DeFoliart, G. (1992). Insects as Human Food. Crop Protection, 11, 395-399. DuBose, C.N., Cardello, A.V., & Maller, O. (1980). Effects of colorants and flavorants on identifica- tion, perceived flavor intensity and hedonic quality of fruit-flavored beverages and cake. Journal of Food Science, 45, 1393-415. Imram, N. (1999). 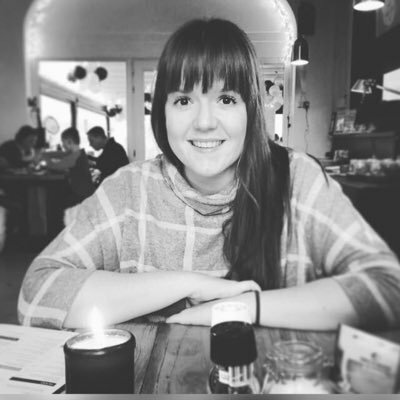 The role of visual cues in consumer perception and acceptance of a food product. Nutrition & Food Science, 99, 224-230. Maga, J.A. (1974). Influence of color on taste thresholds. Chemical Senses and Flavor, 1, 115-119. Sorensen, L.B., Moller, P., Flint, A., Martens, M., & Raben, A. (2003). Effect of sensory perception of food on appetite and food intake: a review of studies on humans. International Journal of Obesity, 27, 1152-1166. Spence, C., Levitan, C.A., Shankar, M.U., & Zampini, M. (2010). Does Food Color Influence Taste and Flavor Perception in Humans? Chemosensory Perception, 3, 68-84.